Once you step into Turtle Shack, you will love it! Very spacious inside and only yards from the beach and the sound with easy access to both. Lounge by your own PRIVATE POOL or hit the beach. 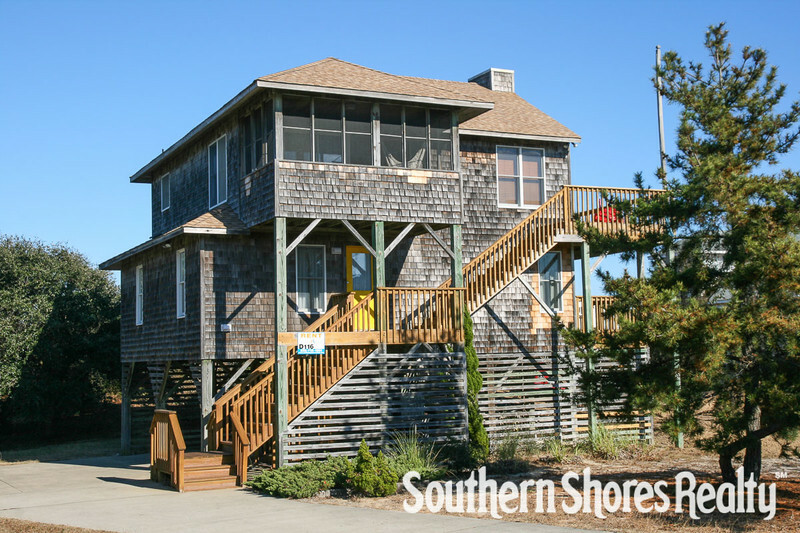 Turtle Shack is located in the quiet community of Sea Tern; you and your family will enjoy this Outer Banks rental home that offers a nice living room with sitting/reading room, well-equipped kitchen, surrounding ocean views, and you can even bring the family dog to this lovely, pet-friendly home. Sea Tern is located on the north end of Duck Village and is conveniently near shopping, dining, and activities for the whole family. You may enjoy touring the Wright Brother’s Memorial and Monument, seeing the wild horses of Corolla or you may want to take advantage of the many water sport activities available, like surfing, fishing, swimming, kayaking, canoeing, or sailing. There’s something for everyone. Laundry room, enclosed outdoor shower, private pool, covered carport, basketball goal, charcoal grill. 4 bedrooms (1 with 2 Bunk sets; 1 with Queen; full hall bathroom, 2 master bedrooms each with Queen and full bathroom). Living area with sitting/reading room, kitchen, dining area, breakfast bar seats 5, half bath, screened porch. Turtle shack was in a great location! Short walk to the beach and short drive into town. The pool area was great for the kids who enjoyed the pool and the beach every day! The house is nicely decorated with comfortable furniture and a well stocked kitchen. We also enjoyed the games and puzzles that were provided. (In comparison to the other review here - there was a newer coffee pot and we didn’t have any issues with ticks on the children or the dogs). Great location! Comfortable furniture. Kitchen was well stocked. Would be nice to have a toaster in the kitchen and a new coffee pot. Overall very good décor and beautiful house. Lacking on upkeep. The lawn was not mowed the entire week we visited and was overgrown, thus making the ticks awful! We even found them in the pool area and my daughter ended up with one attached to her arm after swimming. Screens were not in the porch area upon arrival but we called and they got them in shortly after. With a little upkeep, would be a great rental.